Actually! The vast majority of Japanese television is rather tame. But every year or so, there are a couple shows that are, ahem, unusual. Bless them. Amid the variety programs and talk shows, many Japanese TV programs have celebrities walking around different places, eating local cuisine. If you’re into regional culture, the shows aren’t boring, but the format feels somewhat tired. You know a good way to change that? Kaiju and space aliens, that’s how. Ultra Kaiju Sanpo figured out a good way to shake up that stale formula: add monsters! The show has monsters from the Ultraman series take strolls (sanpo or 散歩 means “walk” or “stroll”), check out the various sights and eat food on Earth. You know, instead of trying to conquer it. 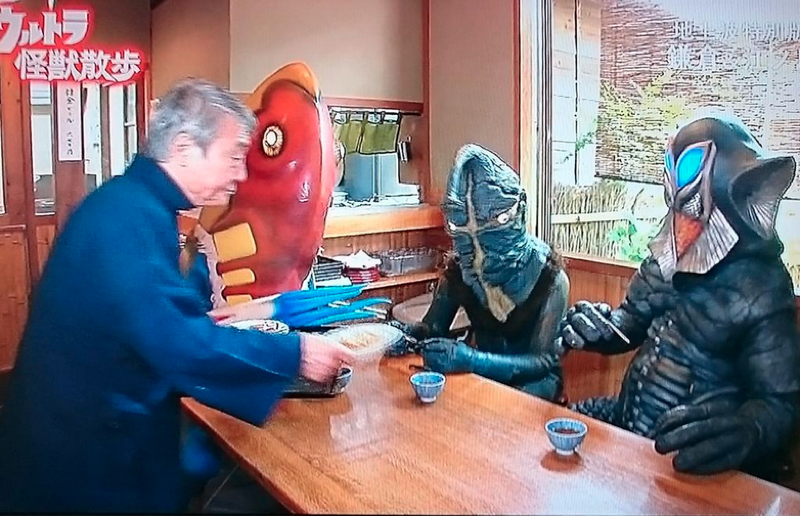 The kaiju talk and interact with each other like your typical Japanese celebs, cracking silly jokes, and eating ramen. Japanese comedians Tokyo03 provide the voices—and the wisecracks—for the kaiju and the aliens. It’s unreal to see cruel creatures like Kemur Man, Alien Mefilas, and Alien Metron goofing around like this. This clever show is from Tsurubaya Productions, which makes the Ultraman shows and movies, so these are the actual kaiju suits the actors wear. That makes this show even cooler. No wonder Hideo Kojima is a fan. Follow the Kaiju Sanpo Twitter account for more photos and hijinks.